Today’s recipe comes from historic Fishtown in Leland, Michigan. Fishtown was an active fishing village in Northern Michigan in the early 1900s, and today it remains as one of the only working commercial fishing villages in Michigan. These days, the fishing shanties on the dock are more likely to house chic boutiques and specialty food shops. However, you can still walk along the docks and observe smoke coming from the smokehouses, fishnets drying in the sun, and the fishing tugs coming in. Fishtown was designated as a Michigan State Historic Site in 1973 and was listed on the National Register of Historic Places in 1975. One of my favorite places for food and drink in Leland is the Cove, located right at the head of Fishtown, overlooking Lake Michigan. The ambience is great, the food delicious, and the beer is cold. However, the Cove is probably most famous for the Chubby Mary, an over-the-top Bloody Mary with a smoked chub poking out of the glass. Whaaat? Is that a fish in that drink? Trust me folks; the tomato juice, horseradish, lime and lemon juice, and Worcestershire sauce soak up the smokiness of the fish, and it’s delicious. Mario Batali, who settled in the area, thinks so too, so it has to be good, right? Another Fishtown special is Smoked Whitefish Spread. Smoked whitefish is a little hard to come by in Northern Virginia, so I make this with smoked trout with excellent results. There are variations of this recipe everywhere, but the foundation is the same for all – smoked whitefish is combined with something creamy and some seasonings to make a spread that will go with everything from tortilla chips to rye bread. It’s the perfect appetizer for your next dinner party. With a salad and some bread or crackers, it also makes a pretty decent lunch or snack. You can experiment with various kinds of smoked fish for this recipe. The original calls for whitefish, but smoked trout, mackerel, and smoked salmon would work ask well. I used one package of smoked trout filets with good results. Serve with thin slices of cocktail bread, crackers, or crudites. Peel the skin off the fish, remove any pin bones and flake into a bowl, using your fingers to break the fish into tiny pieces. Beat the cream cheese in a bowl until smooth. Add the yogurt, Tabasco, lemon juice, and salt and stir until smooth and completely blended. Fold in the scallions and trout until distributed completely throughout the mixure. Taste for seasoning and serve. 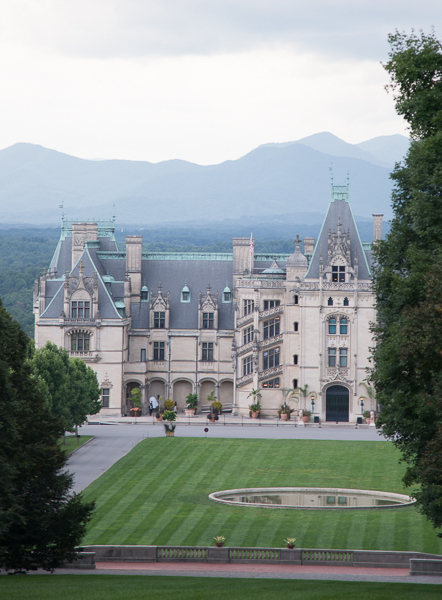 Today’s recipe is inspired by the Biltmore Estate in Asheville, NC. This is my fourth and final post on Food Blog Forum 2014. The food, the networking, and the forum sessions were all wonderful; however, for me, the stand-out was the city of Asheville itself and the wonderful hospitality that was shown to our group by the Biltmore and Explore Asheville Foodtopia personnel. 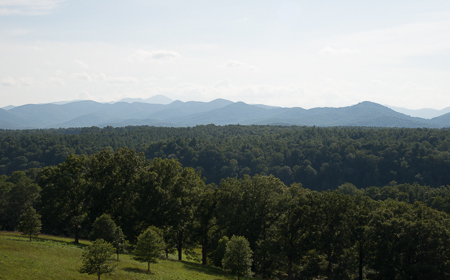 Perhaps while while enjoying the view of the Blue Ridge Mountains from the loggia. 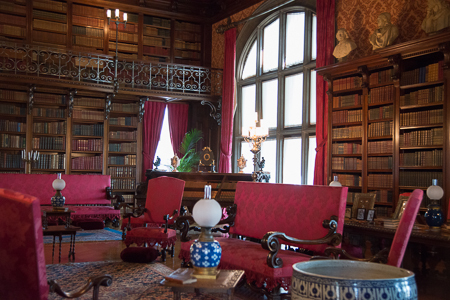 I love libraries, and this one is no exception. I could see nibbling on some cheese straws, while cozied up on the sofa with a book. 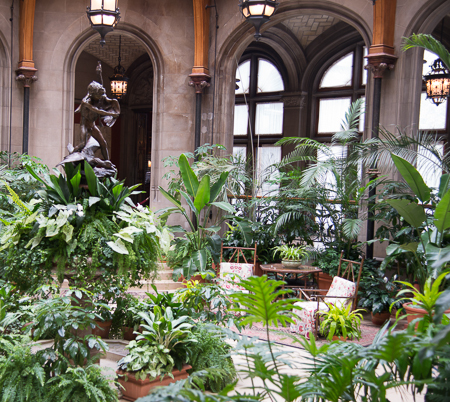 Guests were often offered a cup of tea and a snack while waiting in the winter garden. 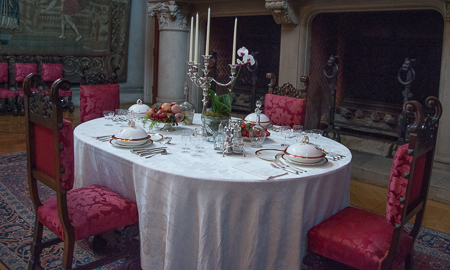 Or for a more formal high tea, I can imagine sitting here with a tray of palmiers. Party season is approaching, and both of these appetizers are great with cocktails. They go nicely along side a hot bowl of soup as well. Do not fear puff pastry. If you can use a rolling pin you can make this pastry. The one thing you must remember is to keep your dough cold. Chill the counter if possible (see recipe note below), and keep the space as cool as you can. This is not a recipe for a hot summer day, without a good air conditioner. If the dough gets too warm, you’ll know because it will become a little greasy and sticky. No worries, just pop it into the refrigerator for about 10 minutes to cool it back down. This recipe does take some time, but the taste of puff pastry made by hand with real butter is so satisfying. This recipe makes 2 pounds of puff pastry. Store-bought puff generally comes in 14-ounce to 1-pound boxes. 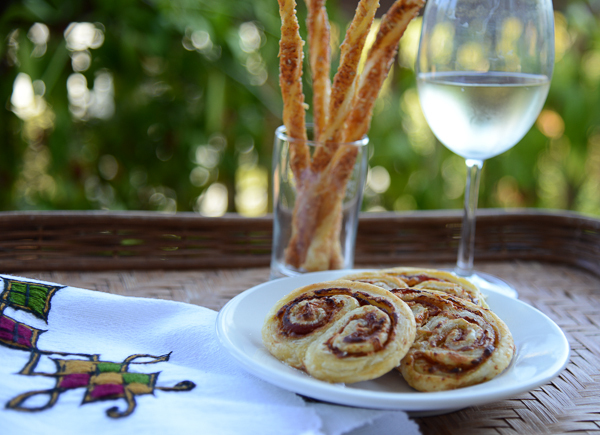 If you prefer to use store bought puff pastry, skip ahead to the cheese straw and palmier recipes. 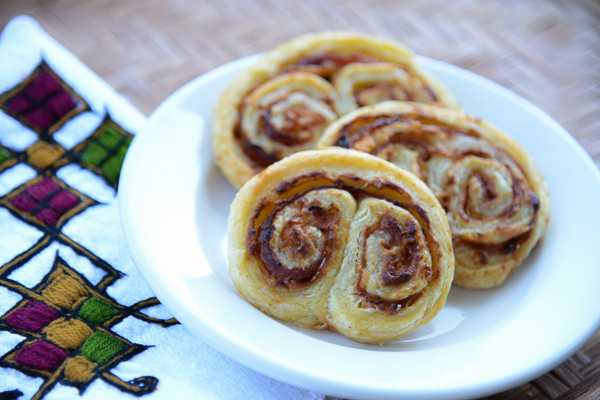 Use 1 box pastry for each appetizer or half of this recipe. The pastry can be frozen. Thaw thoroughly in the refrigerator before using. Before starting chill a section of counter space with a sheet pan with some ice in it on top of a towel. This step is not completely necessary but it will help keep the dough chilled while you work with it. 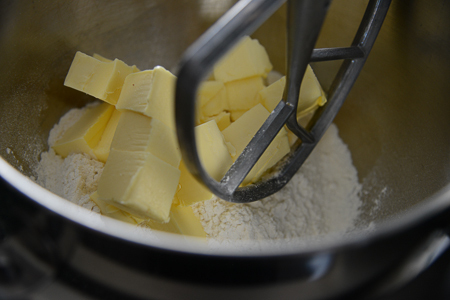 Place the flour, butter and salt in the mixer bowl. 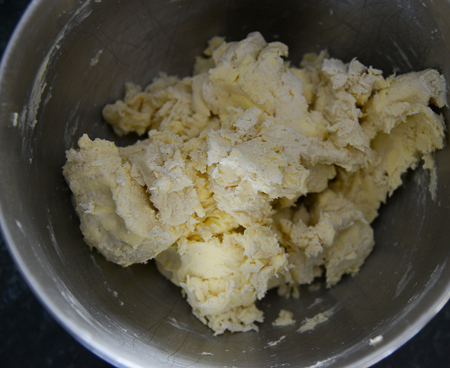 Mix together a little by hand, then pulse the mixer with the paddle to coat the butter chunks with flour. Add the water and the lemon juice all at once then pulse the machine until a sticky dough forms. Flour the work surface with enough flour to keep the dough from sticking. Place the contents of the mixer bowl onto the chilled work surface. Use your knuckles to push the dough into a large rectangle. Make sure the rectangle can be moved with a pastry scraper. 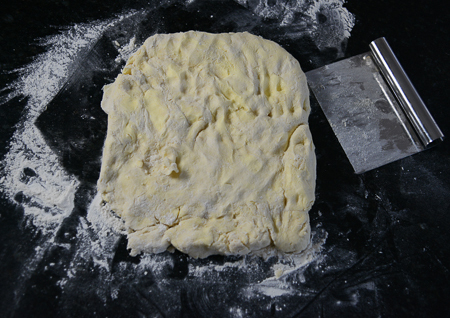 Roll out the dough into a large rectangle, then fold into thirds. This is called a turn. 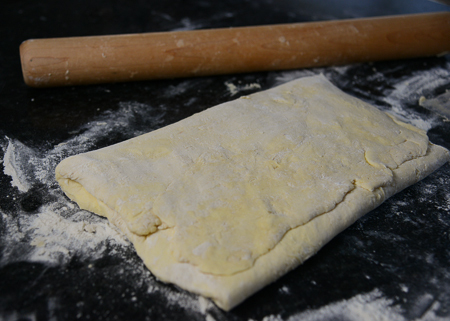 Turn the dough 90 degrees so the short edges of the rectangle are to your right and left and roll the dough and fold again. Continue rolling and folding until you have completed four complete turns. If you work fast you can probably complete all the turns at once. But, if you are doing something else (like photographing the process for this post), you will need to refrigerate the dough between turns. You must keep the dough cold while doing the turns to create the layers in the pastry. Chill the dough until ready to use. 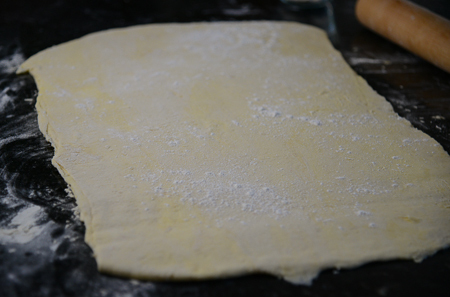 When you are ready to continue, roll out the dough into a large rectangle about 1/4-inch thick. The wonderful thing about this recipe is its versatility. The sky is the limit on how much or what type of seasoning you use. You can prepare the cheese dough ahead of time. After coating with toppings roll up like a jelly dough and freeze. Thaw in the refrigerator 12 hours or overnight before cutting and baking. If making both recipes I prepare the cheese straws first, then raise the oven temperature to 400 for the palmiers. Preheat the oven to 350. If you have not already done so, roll out your puff pastry dough. Brush the surface with egg, then sprinkle with half the cheese, sesame seeds and paprika. Turn the dough over and repeat. Cut the dough into 1/4 or 1/2-inch strips and twist before placing on a sheet pan or cookie sheet covered with parchment. Push the ends of the strips flat agains the pan to hold them in place. 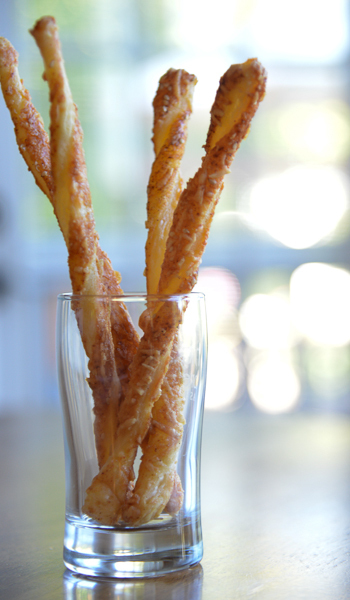 For shorter, fatter cheese sticks, fold the strips in half before twisting. Bake for 15-20 minutes or until golden brown. Cool on a wire rack before serving. Good warm or at room temperature. Preheat the oven to 400. If you have not already done so, roll out your puff pastry dough. Spread the mustard over the dough. 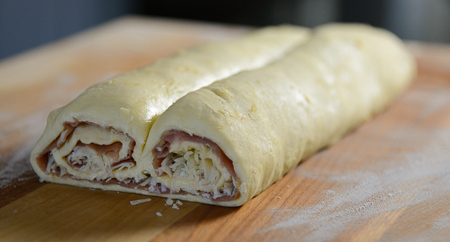 Arrange the prosciutto over the mustard so that it covers the pastry completely. Sprinkle with the parmesan and lightly press it into the prosciutto with a rolling pin. Chill the roll for 30 minutes before slicing the rolls crosswise into 1/2-inch thick slices. Place on parchment-covered sheet pans or cookie sheets and press with your hands to flatten. Brush with egg. Bake 15-20 minutes until puffed and golden. Cool on a wire rack. Can be served warm or at room temperature. A couple of years ago in a quest to find an eating plan to negate the rich cuisine and fabulous beer we were enjoying a little too much in Germany, I stumbled upon something called the Primal Blueprint. It’s a variation of sorts on the Paleo Diet; however, unlike strict Paleo, it allows some rice and a little high fat dairy. Both plans stress “real food” and restrict consumption of grains, legumes, and refined sugars. As with most restrictive eating programs, I wasn’t very successful, but my husband was and continues the program to this day. I believe the Primal Blueprint is a good program for a lot of people, my husband included, and I try to be very supportive of his new, healthier eating habits. It probably doesn’t hurt me to cut back on carbohydrates either. Eliminating most grains and legumes (what no sandwiches?) proved to be a challenge. Although we have always tried to limit processed food, I was clearly in the “no fat, whole grains” camp, and this was a complete switch. It was also a great excuse to add to my ever-expanding cookbook collection. I read every Primal and Paleo cooking blog I could find online and eventually figured out on whom I could probably rely for some decent recipes, while I learned to plan menus around this new eating style. Everyday Paleo quickly became one of my favorites. One of the first books I bought was this one, and one of the first Paleo recipes I made was dates stuffed with sausage and wrapped in bacon. I wish I could take credit for this recipe. One bite and I was hooked. I have yet to meet anyone who does not like this recipe, Paleo follower or not. We have found that Medjool dates work best for this recipe, but if you can’t find them any other type will do. 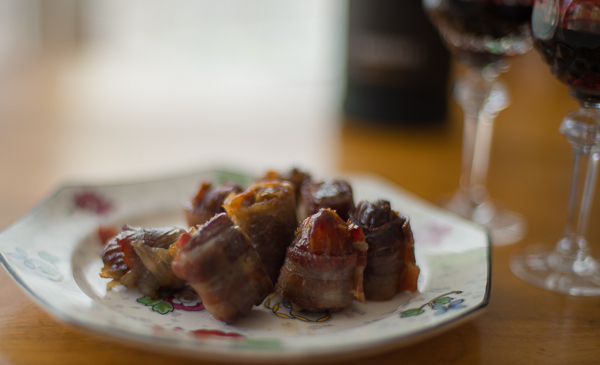 If they are considerably smaller, you will need more dates and more bacon than the recipe calls for. This recipe doubles or even triples easily, a good thing since it’s so addicting. Pit the dates if necessary, by slicing them lengthwise halfway through and removing the seeds. 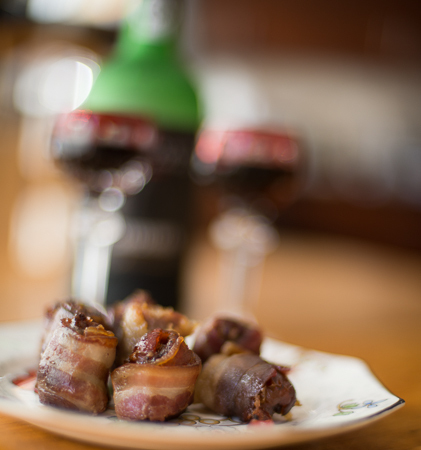 Use about a tablespoon of sausage per date, more or less depending on the size of your dates. Stuff the sausage into the date, wrapping the date around the sausage ball. The dates will not close around the sausage completely. 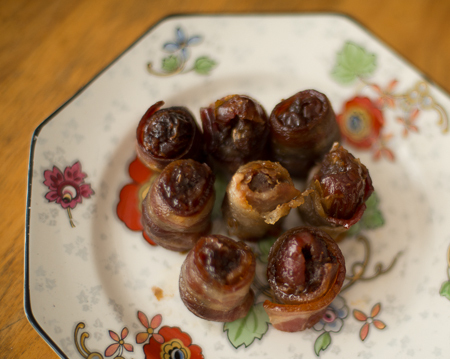 Wrap each date in one of the half slices of bacon and stand up in a baking dish small enough to hold the dates upright. Depending on the number of dates you are preparing a small to medium Pyrex works great for this, but you could also bake them in a pie pan. Bake dates for 40 minutes. These can be prepared ahead of time, frozen, and rewarmed in the microwave for 1.5 minutes. It’s great to have a stash in the freezer for unexpected guests. When I was in culinary school, we spent a considerable amount of time honing our pâte à choux skills. Choux pastry is a combination of eggs, flour, water and butter that results in a light fluffy pastry used for éclairs, cream puffs, and other pastries. 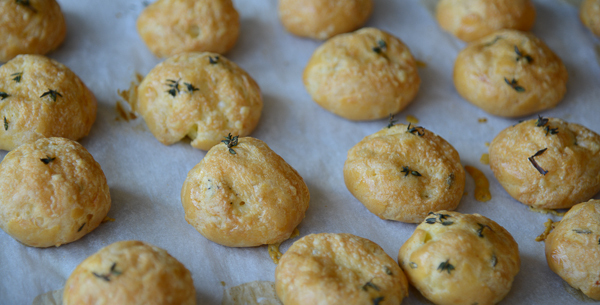 I think we probably made it every way possible, but I never had the chance to make gougères, the savory puffs with cheese in the dough. I often saw the pastry class making them, even had the opportunity to try them, but waited in vain for the day our class would finally make them. Maybe I missed that day, who knows? It was many years ago and I had all but forgotten my desire to make gougères, when I came across a recipe for them in an old copy of Bon Appetit magazine. I was looking for ideas for a party and decided herb-flavored gougères would make the perfect cocktail snack and they did. I had a pile of fresh thyme that I didn’t want to lose and it turned out to be wonderful with the gruyère I used. You could vary the type of cheese you use and use any type of herb – an Italian version with parmesan and oregano, a fall version with sage and fontina…the possibilities for this recipe are endless. Please do not be put off by the difficulty level of this recipe. It’s actually quite simple to make and the results are well worth the trouble. These can easily be made ahead of time and frozen. Place frozen gougères on baking sheets in a preheated 325-degree oven and warm for 15 minutes. Preheat the oven to 400 degrees. Line two baking sheets with parchment. Place butter, salt, and 1 cup warm water in a medium saucepan; bring to a boil and stir until the butter is melted. Remove the pan from the heat and stir in the flour. Place the pan back on the stove on medium heat and stir vigorously until the mixture pulls away from the sides of the pan and forms a ball, about 2 minutes. Continue stirring for another 2 minutes. A dry film will form on the bottom and sides of the pan and the dough will no longer feel sticky. Mix in the eggs, one at a time until fully incorporated, then stir in the cheese, half of the thyme and the pepper. Place the dough in a piping bag with a 1/2-inch round tip or a plastic bag with a 1/2-inch opening cut from a corner. Pipe 1-inch rounds about 2 inches apart on the prepared baking sheets. Whisk the last egg yolk with 1 teaspoon water and brush it on the dough rounds. Sprinkle the rounds with the remaining thyme. 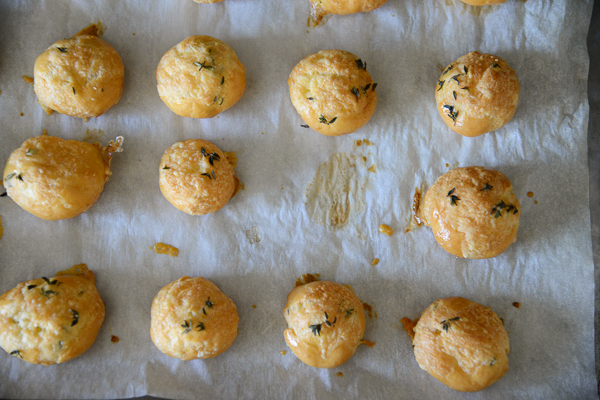 Bake the gougères until puffed up and golden; 20-25 minutes. They will dry out in the center and will sound hollow when you tap them. We’re having a few friends over for the annual Fall fiesta this week, so my next few posts will be recipes for some of the food I’ll be serving at that gathering. 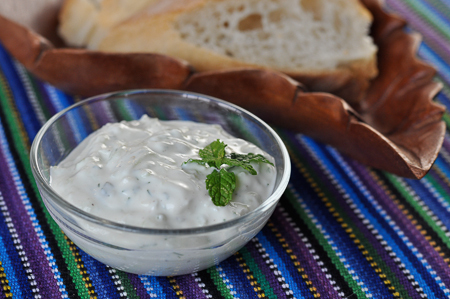 Let’s start with tzatziki. I first tasted this marvelous dip my second day in Athens, Greece, where I would be spending the next 3 years working at the U.S. Embassy. It was a great assignment, so much so that my friends and I still refer to that time as the “golden years.” One of my first real Greek meals was lunch at a taverna on the top of Mount Lycabettus, a limestone hill overlooking the older part of Athens. It was a splendid Spring day – with those famous blue, blue skies contrasting with the white buildings for which Greece is so well-known. Lunch consisted of a huge Greek salad and Tzatziki with bread. Simple, yet mind blowing. The coolness of the yogurt created the most amazing flavor when contrasted with the garlic and olive oil. I fell in love with tzatziki that day and I think I have made it almost every time I’ve entertained since that fateful day. The dip is traditionally served with chunks of hearty bread for dipping; however, I have found that it also makes a wonderful side for any kind of grilled meat, but especially lamb. Greek yogurt is now readily available in supermarkets in the United States. I prefer Total yogurt. 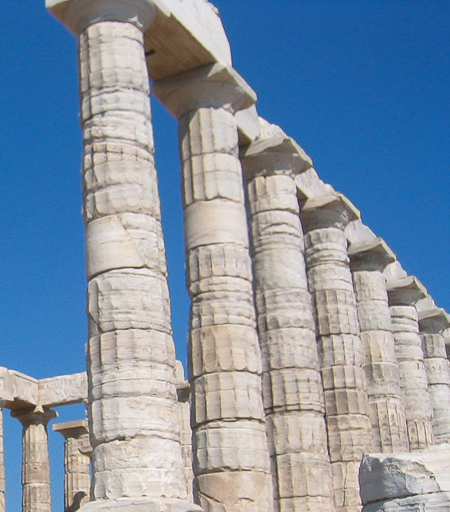 It’s what I used in Greece and I believe it provides the best consistency. If you like a really stiff dip or cannot find Greek yogurt, place the yogurt in a cheesecloth lined colander or strainer over a bowl and refrigerate overnight. I have found that ciabatta most closely resembles the bread used for dipping in Greece; however, you can use any white bread with a hard crust, such as baguettes or Italian bread, or even pita wedges. This recipe can be easily doubled or even tripled for parties, or because you just can’t stop eating it. 1. Seed the cucumber by cutting it in half lengthwise and using a teaspoon to scrape out the seeds, then grate it and place in a colander and sprinkle liberally with salt. Allow to strain for 15 minutes. Press on the cucumber to squeeze out as much liquid as possible. If it still seems too wet, place in a towel or piece of muslin and roll it up to squeeze out any remaining liquid. This step will prevent the dip from becoming too watery. 2. Finely chop the garlic with enough salt to make a coarse paste. Mix the garlic paste with the cucumbers, yogurt, vinegar, mint, 2 tablespoons olive oil and salt and pepper to taste. 3. 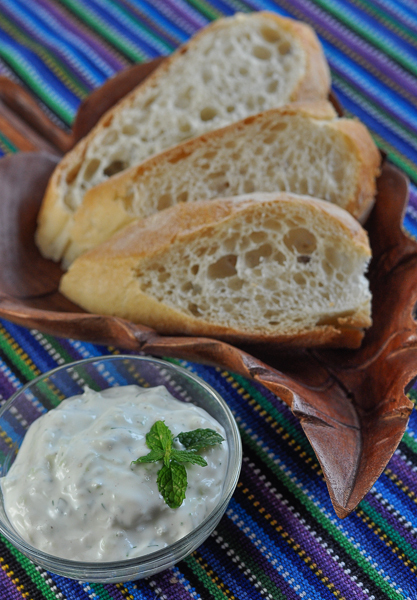 Place the tzatziki in a serving bowl, and drizzle with the remaining tablespoon of olive oil. Serve with bread for dipping or alongside grilled meats.